Due to the weather, the MAA Complex is closed today, Saturday, April 20th. All MAA softball and baseball games scheduled at the MAA complex for today are postponed. Please contact your coach for any cancelations of away games scheduled for today! MAA - April Fundraisers - No Cook Nights Throughout the Month! MAA April Fundraisers - No Cook Nights! Looking for a reason not to cook? Look no further - throughout the month of April, MAA will be holding 3 No Cook Nights! Come enjoy great food, show your spirit and support a great organization at the same time!! Flyer must be present for the events. Click on the links below to open as PDF and print. Middletown AA appreciates your support of our organization and of the our community! Don't Miss Out! Spirit Available through 4/15/2019! We hope you enjoy the selection of items available. If the order is submitted successfully, you should receive an email confirmation. If you do not receive a confirmation then your order did not go through. If there are any back orders on the items selected, we will contact each person via email and explain the options available. Please make sure that you select the correct sizes. Order are not processed until after the store closes. We need approximately 3 weeks AFTER the store Closes to complete the orders. If we experience back orders on any items, we will notify you and resolve it as best as we can. Minimum orders do apply to certain printed items, and Team Sports Zone reserves the right to refund the amount paid for these items. We do check inventory for the items prior to opening the store, however, stock levels can change quickly, particularly with Under Armour. We do not like to inconvenience our customers with back order issues, but sometimes it cannot be avoided. Also, there are no refunds or exchanges on any item, particularly personalized items, since the apparel is ordered based on the information provided. Please see the preview of available items below. Thank you for your support of Middletown A.A. and enjoy your shopping!! Please sign up and earn your volunteer fee back!! Every 2 hour shift worked is $25.00 toward earning your $100.00 fee back. We will need help in both snack stands through the beginning of June. Please look through the full schedule and see what will work best for you. You are more then welcome to sign up and help for as many shifts as would like** as we are always looking for volunteers!! Click the link below to enter the Signup Genius to make your selections. Good Luck to All Our Players and Have a Great Season !! **Although you can sign up for as many shifts as you like, you cannot earn more then $100 back total for all volunteer activities that you participate in at MAA. 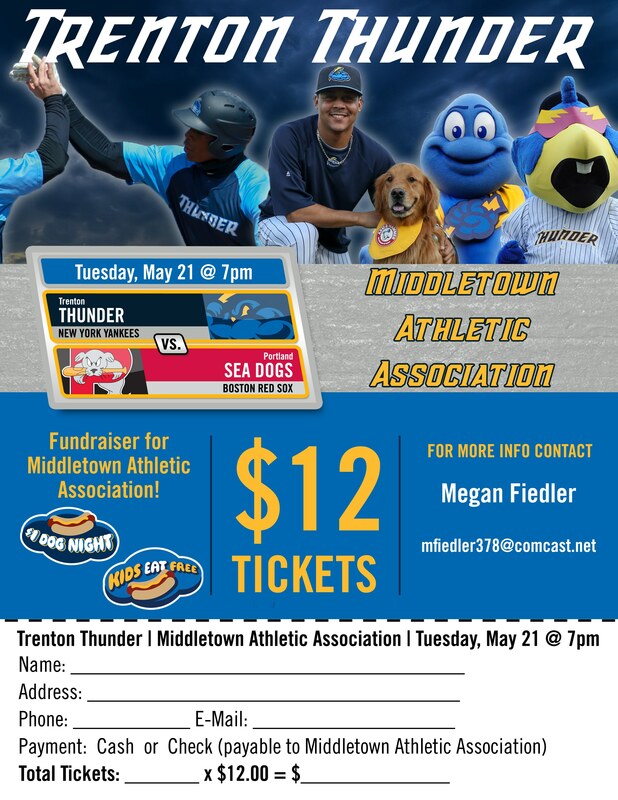 MAA - Trenton Thunder Night Tuesday, May 21st! Please join us once again for our annual Trenton Thunder night being held on May 21st, 2019! Players will get to Parade on the field prior to the game. In addition they will also participate in a Field of Dreams as they stand next to one of the players during the playing of the national anthem! Please note that players will only be allowed on the field if they are wearing their In-House MAA uniform shirts and hats - No Suburban/Travel Shirts or Hats are to be Worn!! In adition - Kids eat free and it's Dollar Dog Night at the Arm & Hammer Ballpark that evening! Thank you and see you at the ball park!